Home » Interviews and Submissions » Faida.Com brings back the barter model of exchange to consumers! Faida.Com brings back the barter model of exchange to consumers! CSAT360 is pleased to share excerpts from its interview with Vipul Paliwal, who co-founded Faida.Com alongwith Gaurav Jain, with a vision to offer a win-win experience to its consumers through a unique market place model. Please tell us how you came upon your business idea and how do you create an awareness of its benefits. We chose the name Faida as it means benefit for everyone. Gaurav is the brain behind this unique concept. While he was in America, Gaurav realized that unlike in the US, Indians are much more attached to their stuff and seldom throw it away. It is here that the old concept of barter came to his mind. This would help us declutter our homes and exchange stuff we don’t need and at the same time helps recycling and have something we need in exchange. We have a marketing team that works very diligently on this also we have been promoting this very extensively through Social Media channels. What is the system or process that you have established for customers to use Faida.com? 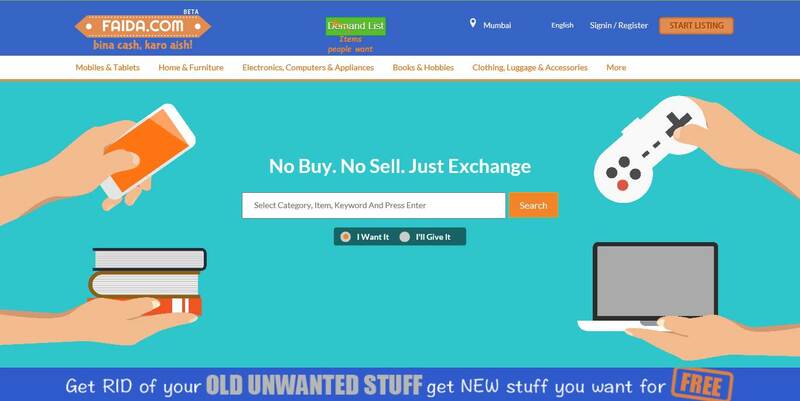 You have to list your unwanted items at Faida.com. Then select item/items of your interest offered by another user. You then send an exchange request to that user. When your request is accepted, meet them up and inspect each other’s items, Exchange or reject items. We advise our customers to exchange within the city to ensure that both sides meet each other and ensure that they are getting what they need. This works better as no cash is involved and exchanging is better than buying/ selling because it promotes recycling or re-usability. A win, win situation is realized at Faida.com when one’s clutter is useful to another without any involvement of money. Exchange can benefit two parties alike. We are a market place model where we bring people who have common interests / products to exchange together. Barter system was predominantly an ancient concept. The concept of bartering was lost in between as people could not find the right kind of people to exchange products. But with the emergence of technology this has become more accessible. Bartering is catching up now and helps save money as it works on cashless transaction which is the need of the hour. People are willing to exchange articles as it helps them save money and at the same time get rid of unwanted stuff and get something they really need. Youngsters between the ages of 18 to 30 years are more eager to barter for items and save on resources. When one buys something absolutely new one has to spend more money which they sometimes do not want to spend on. That means they will have to cut down more on their expenses and save more to buy something brand new for which they will either have to wait or take a loan. We are seeing more people list their products on Faida.com so barter is something people believe in as they surely understand that it is a way of saving money. Since its launch in July 2015 we have had a listing of 12359 products and 6963 desire to exchange. We have also introduced the chat feature where people can get more information. We are very soon going to enter the app space which will be launched soon. We faced the initial challenge to make people list their products. As we are a startup with a unique concept so building trust and credibility was absolutely vital for us. Like every startup we too worked on this diligently and now we have about 3500 ready to exchange products and services. Your recommendation to other Organizations on improving customer focus ? Its very vital for any organization to remember that the customer comes ‘first’. The customer should always be the focus as they are the backbone of an organization. An organization should surely build their trust. Interacting with customers through social media could be one way of doing the same. Bringing face-to-face interactions, special services, and knowledge together could help you to create a unique community for your customers. Vipul Paliwal, Co Founder and Spokesperson for Faida.com firmly believes the current market conditions in India are great for any Entrepreneur, thus inspiring him for promoting the concept of barter through his start up. His keen interest in Digital and Technology space also helped him crystallize the concept further. He believes that right passion, hardwork and a great team are the ingredients for assured success and that makes him extremely confident for Faida.com. His previous experience at S M Paliwal group which handles Minerals,chemicals, stone crushers, real estate and logistics, has given him great experience at management and studying market trends, which is now helping him in formulating winning strategies for Faida.com. Vipul has specialised in Strategic Management from London School of Economics and prior to this, he completed his schooling from Mayo College and an MBA from SP Jain Institute of Management, Mumbai.